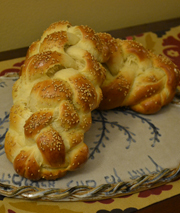 The Hazz and I have several base recipes for challah. The one we've found thus far to be MOST successful in our household (Midwestern Winters can make yeast and flour do funny things). Place very warm (but not hot, I usually let me faucet run for a bit) water in mixing bowl. Add yeast and honey, mixing lightly. Allow to sit for 10 minutes or so... I usually do less... until you see little eruptions. Add eggs and vegetable oil and mix with wood spoon. If you have a stand mixer, add half the flour and salt (premixed is best but not necessary, I can be sort of lazy) and beat with dough hook. While you're doing this, if you're like me, you can clean up the dribbles of yeast, eggs, and vegetable oil you've made all over the kitchen. Add the rest of the flour and salt and continue beating. My stand mixer says I can only have the dough hook on settings mix, 1, or 2... and I believe it, because I accidentally put it on 4 and almost lost a finger. While it's beating, clean up the flour mess you've made. The dough is ready when it sticks together as a ball and is not sticky to the touch when you poke your finger in (5-10 minutes of beating). Add more water and/or flour as necessary (I often need more water and then go too far and need more flour). Turn the ball out onto a floured work surface and punch a few times. Place in oiled bowl (I use Olive Oil Pam) and cover in plastic wrap or a towel. 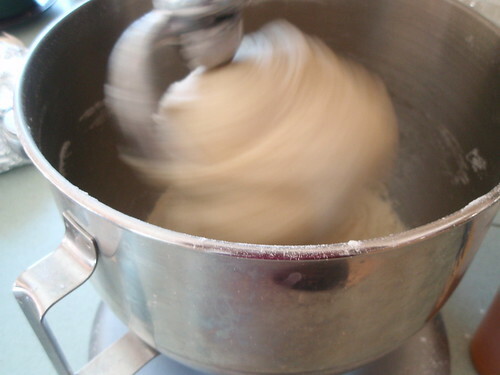 Allow to rise at least one hour, preferrably more, until dough has doubled in size. I only do one rise as a ball, but you can do more. I'm not convinced it does much to the texture but some people swear by it. Punch down the ball in the bowl and remove. Punch out all air bubbles. Braid in your preferred method. Allow to rise 45 minutes. Top with an egg wash (I use the yolk and white) and sesame or poppy seeds if you like. Bake at 350 for around 30 minutes. You can use a bread thermometer (180-200 degrees) or poke at the seams. If they seem doughy, give it more time. You can always add foil if the top seems like its browning too fast. I often have to foil five- and six-stranded challot because they're so much fatter. 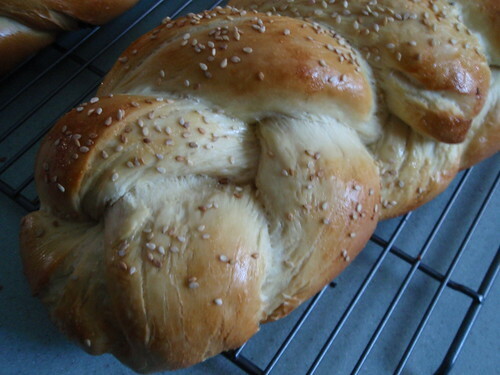 This challah has some honey drizzled on very lightly after the egg wash.